ShukerNature: WHEN TWO HEADS WEREN'T BETTER THAN ONE! "It looks especially weird, because not only the head is double, but also a big part of the postcranial body, that makes it look somehow like one of those mythical entities which are shown as multiple headed snakes with long necks." What a shame, though, that as soon as this extraordinary snake was found it was killed - or 'sacrificed', to quote the paper's authors! It was only a juvenile specimen, so surely it could have been captured alive? After all, some dicephalic snakes maintained in captivity have lived for a number of years. Ah well, even in today's conservation-emphatic times, it seems that the 'collection' of rare and sometimes unique specimens is still very much alive, unlike this two-headed anaconda, unfortunately. Instead, its preserved, now-faded corpse resides in the Coleção Zoológica de Referência of the Campus do Pantanal/UFMS (CEUCH 6024). WALLACH, V. (2007). 2007. Axial bifurcation and duplication in snakes. Part I. A synopsis of authentic and anecdotal cases. Bull. Md. Herpetol. Soc., 43(2): 57–95. Cryptozoologists are (or should be) used to receiving healthy doses of scepticism from mainstream zoological colleagues concerning reports of mysterious, exotic-sounding creatures. I was very startled to discover recently, however, that much the same response can be elicited by teratologists (researchers studying biological freaks and monstrosities) when speaking to mainstream colleagues regarding zoological caprices and curiosities of the teratological kind. 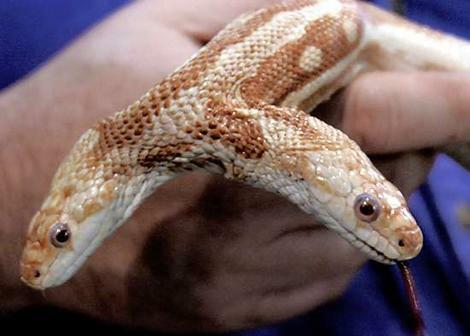 A short while ago, I happened to mention casually to some zoologist friends a quite recent newspaper report about the finding of a two-headed (dicephalic) snake. To my great surprise, no amount of persuading would convince any of them that freaks of this kind do genuinely occur from time to time (usually due to duplication of the embryonic snake's cephalic region during development). Instead, they were adamant that such sports were total fabrications invented by the media to fool gullible readers! Needless to say, this spurred me to research the subject of ophidian dicephaly; and in order to dispel any additional scepticism that may exist concerning it, there now follows a brief selection of some of the most celebrated, fully-confirmed serpentine dicephali on record. In his Log-Book of a Fisherman and Zoologist, the noted Victorian naturalist and eccentric Frank Buckland recorded receiving an odder-than-normal two-headed grass snake Natrix natrix, aged at least 3-4 months old. Whereas many dicephalic snakes have similar heads, those of Buckland's grass snake differed both in size and in location. The larger of the two heads was positioned at the end of the snake's neck (i.e. the normal position). However, the smaller head emerged directly (i.e. not borne upon any neck of its own) from a lateral location some distance further down - thereby emerging from the neck of the principal head, and comprising a parasitic twin. A dicephalic snake (or other animal) exhibiting this condition - in which one head (that of the parasitic twin) is attached either to the neck or lower jaw of the other head - is said to be desmiognathous. During the 1920s, a wild dicephalic specimen of the milk snake Lampropeltis triangulum was discovered living in New York's Bronx Zoo. Unlike Buckland's grass snake, however, its two heads were of equal size, and each was borne upon its own 1-inch-long neck (dicephalic animals with two necks as well as two heads are described as diauchenic). Not surprisingly, this highly distinctive serpent was swiftly captured, thereafter acquiring permanent residence at the zoo as a special exhibit, and was the focus of considerable attention - not least from its own keeper, particularly at feeding time. This was because both of its heads ingested food, which meant that great care had to be taken to ensure that its single gullet did not become blocked by the double stream of food passing into it from the snake's two mouths. Similarly, from 19 March to July 1955 the Arizona-Sonora Desert Museum was the proud owner of a juvenile dicephalic pine snake Pituophis melanoleucus, which lived upon lizards devoured only by the left head. More recently, a dicephalic water snake Natrix sipedon became a major attraction at Miami's Serpentarium, and was featured in numerous newspaper accounts. The Serpentarium's director, Bill Haast, named the two heads Hatfield and McCoy, after the notorious feuding families from West Virginia. As it happened, however, these names would have been far more apt if they had been applied to the heads of what is probably the most remarkable two-headed snake recorded from captivity. Instead, the heads of this latter serpentine dicephalus were respectively named Dudley and Duplex, by staff at San Diego Zoo where it lived for some time during the 1970s. A diauchenic example, it was a king snake Lampropeltis getulus - a zoological identity destined to cause major problems for any two-headed representative, due to this particular species' dietary preference. For the king snake is ophiophagous - it eats other snakes! Imagine, then, the psychological turmoil that must have been taking place within the twin minds of Dudley-Duplex. For here was a situation in which two mentally-independent snakes, both instinctive serpent-eaters, were, by a developmental quirk of fate, doomed to be perpetually in one another's closest of close company. Tormented by continuous temptation, it could surely be only a matter of time before the inevitable happened. And one day it nearly did - keepers arrived only just in time to prevent Dudley from bring swallowed by Duplex! On this occasion, peace was restored, and the crisis was averted, but quite evidently the memory lingered. For not long afterwards, Dudley took his revenge and actually succeeded in swallowing Duplex - only to discover too late of course that in killing Duplex he had fatally wounded himself. A short time later, this extraordinary but ultimately tragic double-act died - a victim of a truly unique case of fatal attraction. Finally, a notably unusual dicephalic snake was captured on 13 May 1975 at Salta, Argentina. This specimen's single body not only sported two heads but also possessed two tails. An individual that displays duplication of its anterior and posterior ends while its body region remains a single entity is referred to as a dicephalus dipygus (or, less commonly nowadays, an anakatadidymus). Measuring 18 in long, Salta's two-headed snake was also unusual in that only one head ingested food (albeit voraciously), the other not functioning at all - though in view of the Dudley-Duplex saga, this may have been no bad thing. Clearly, two heads are not always better than one after all!